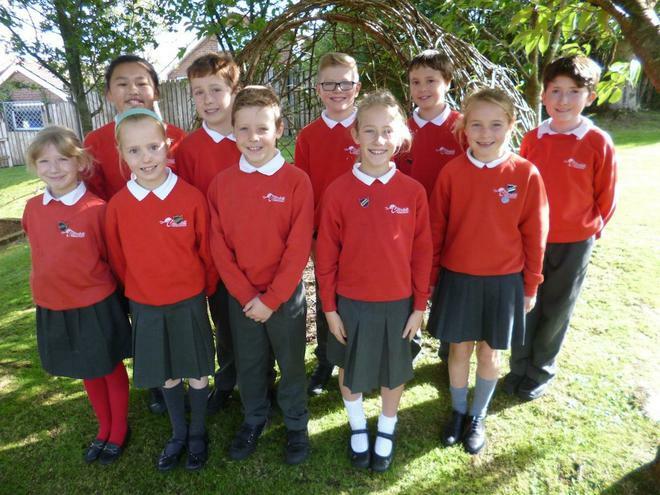 An excited group of School Council members met together this week for the first time. 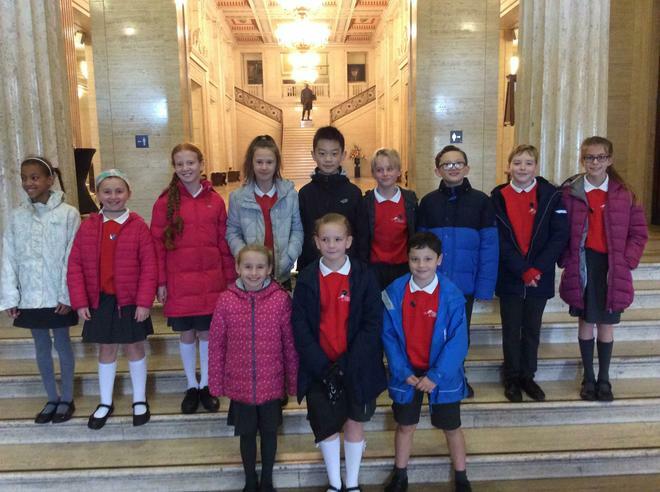 They represent classes from P5, P6 and P7 and have the opportunity to put forward ideas and help to make school a great place to be. 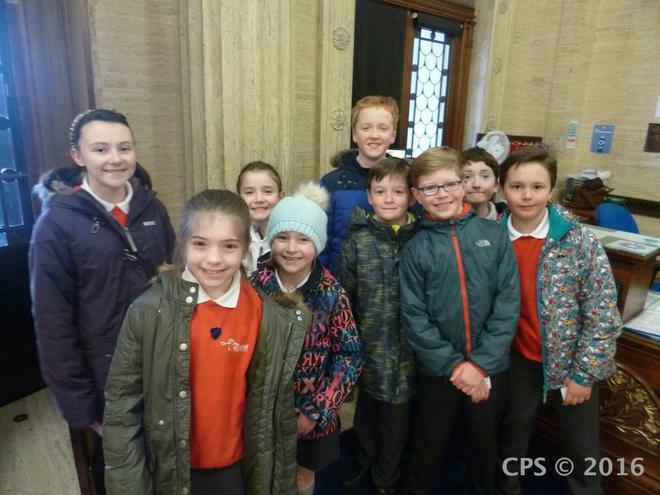 Mrs Currie met the School Council at assembly and heard some of their inventive ideas such as indoor games during lunch time, growing a herb garden, more water dispensers, buddy groups, baking activities, fancy dress daily mile day and many more!! 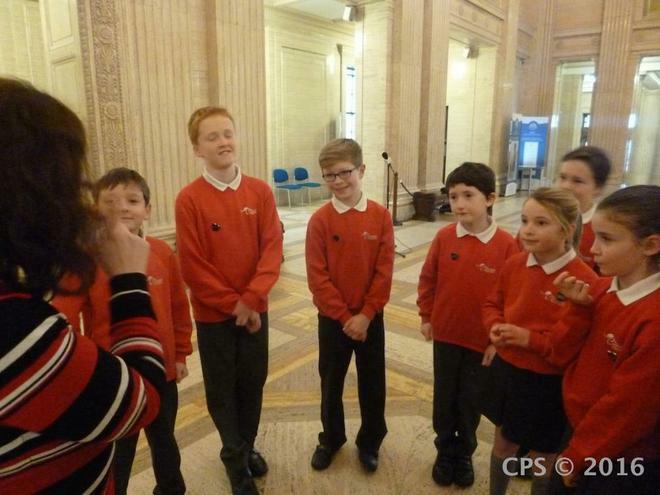 The pupils were delighted to receive their lovely new badges and look forward to their next meeting. 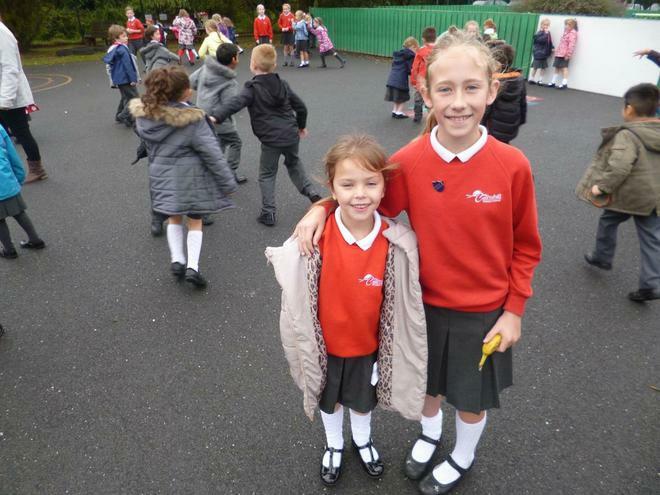 Break time buddies will start again on Wednesdays and we thank all staff who help and encourage the School Council during these times. 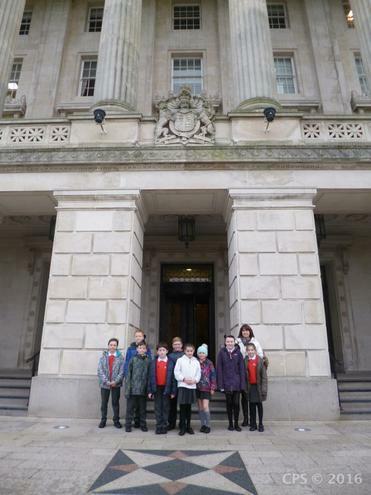 We look forward to visiting Parliament Buildings at Stormont and there will also be competitions for Key stage 2 pupils to take part in, nearer Christmas. 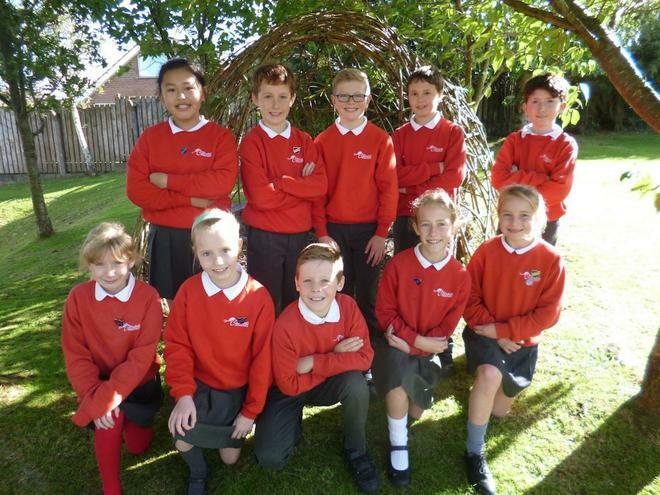 We wish the School Council a great year! 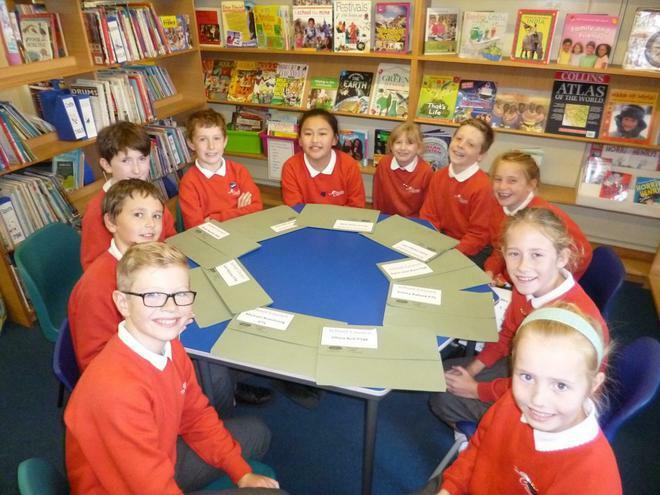 School Council members have now met together and they have already been sharing lots of ideas. 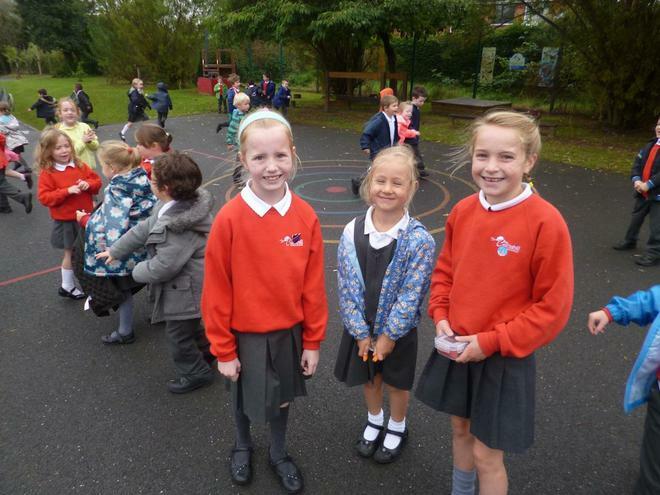 The Wednesday break time buddies have been working hard to help the younger children feel included and happy in the playground. 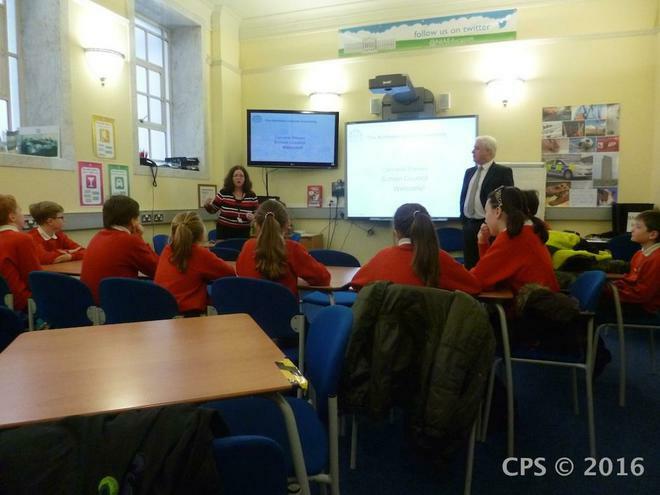 A newly appointed Chairperson and Secretary have been elected for this term and the minutes from the meeting have been passed to teachers and members. 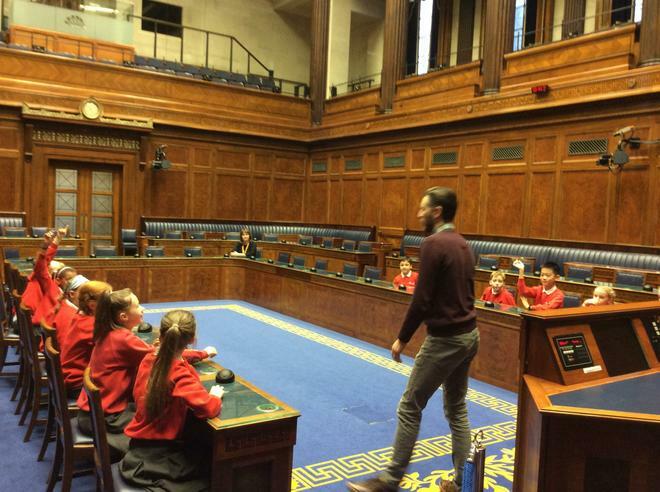 In November, School Council will be visiting Assembly Buildings at Stormont to learn more about how local government operates. 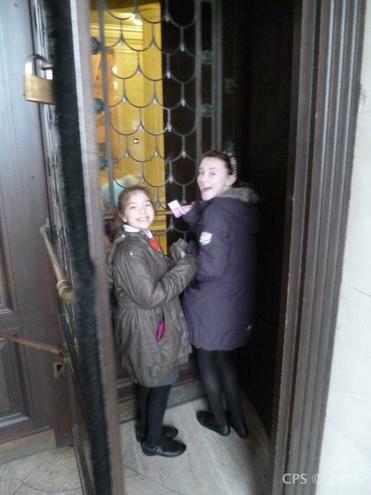 There is also the annual SC Christmas tickets and programme cover competition to look forward to after half term too. 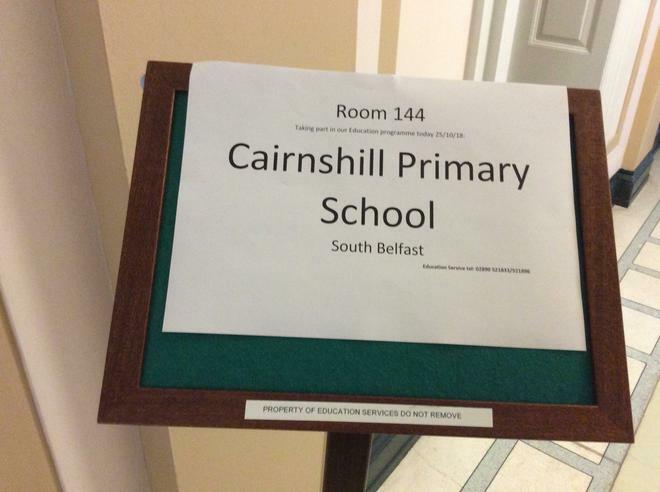 Again this year, School Council intends to help to make Cairnshill Primary School a great place for pupils and staff to work together and share ideas. 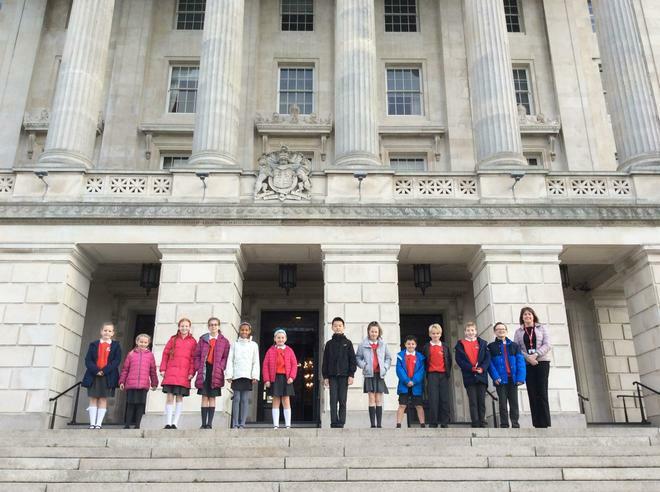 On Friday 18th November 2016, an excited group of School council members accompanied by Mrs Graham and Miss Bingham travelled to Stormont Buildings in Belfast. 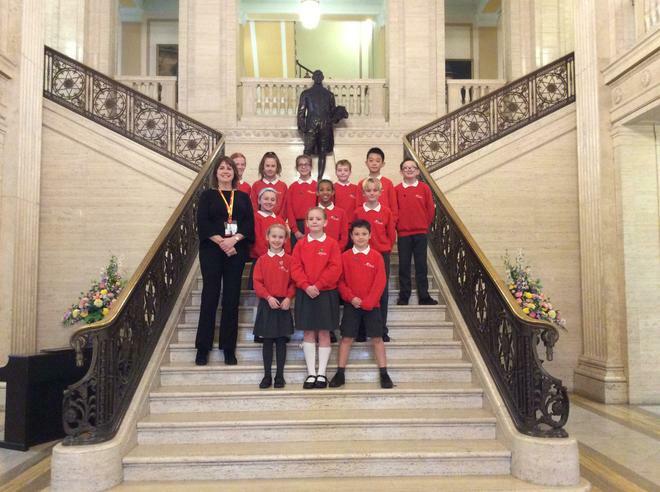 Every year we feel it is really important for the children to learn more about the work of MLAs and appreciate how School Council members have a similar responsibility and commitment to the children at school. 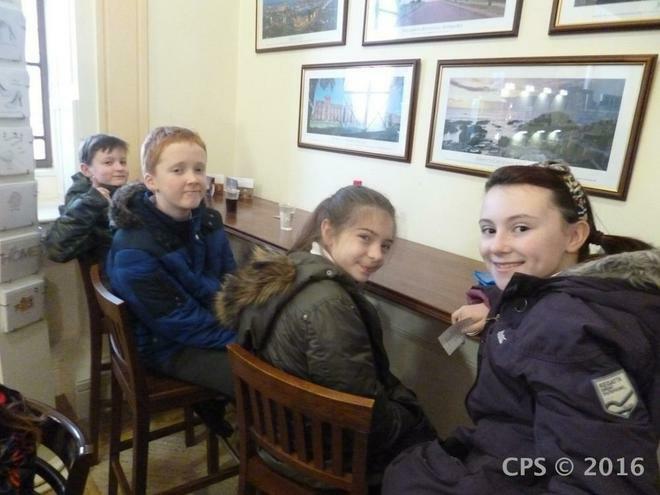 Our morning visit started with a short trip to the café where Mrs Graham very kindly treated everyone to a drink and a kit-kat! 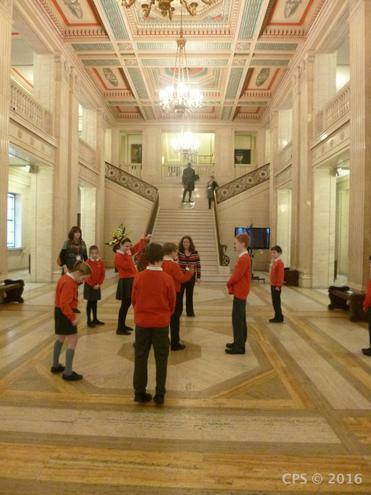 Anti-bullying week happened to take place on the week of our visit to Stormont and the School Council members participated in an art activity to promote anti bullying with other visiting schools. 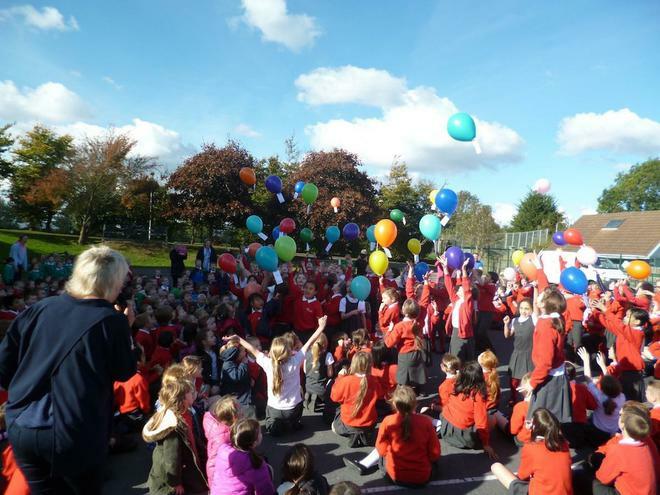 Many hands displayed together created a striking visual display to demonstrate the need to stamp out bullying in schools. 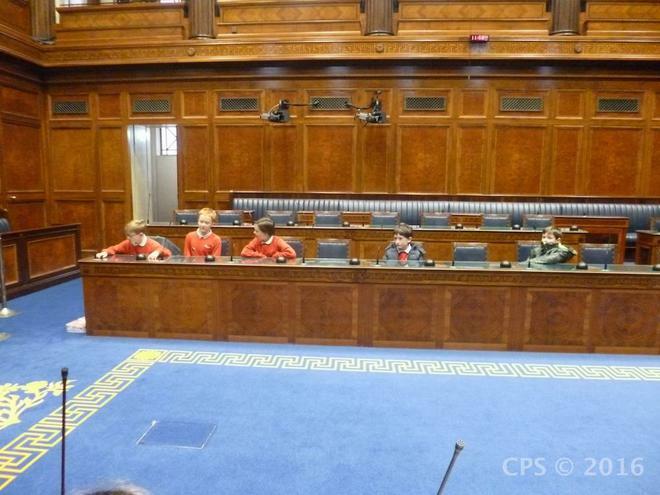 As usual Anne-Marie Fleming (Education Officer) delivered an excellent explanation of how decisions and laws are made in the Assembly and how the political parties have differing and similar views. 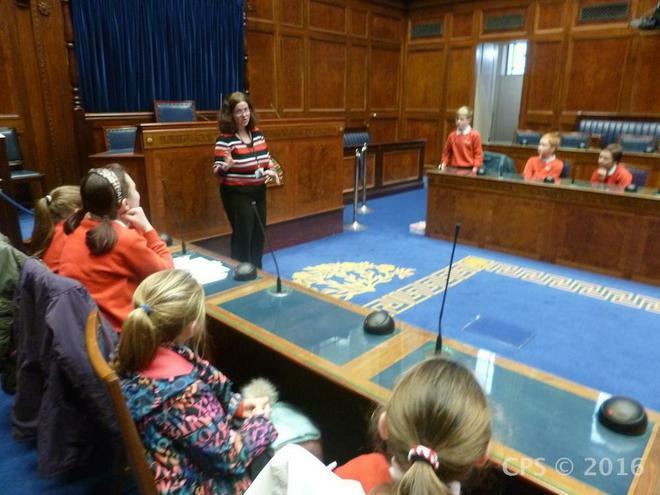 The pupils had the opportunity to suggest new laws which they think should be put in place and they debated together in the chamber. 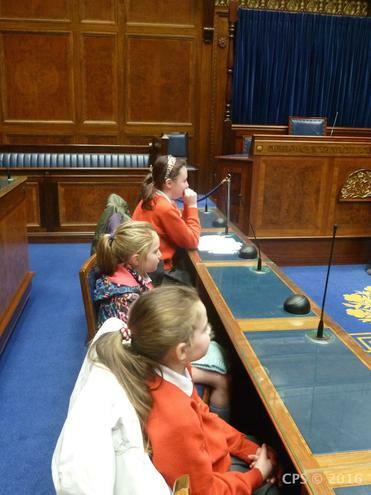 One suggested law was that there should be no school uniform. 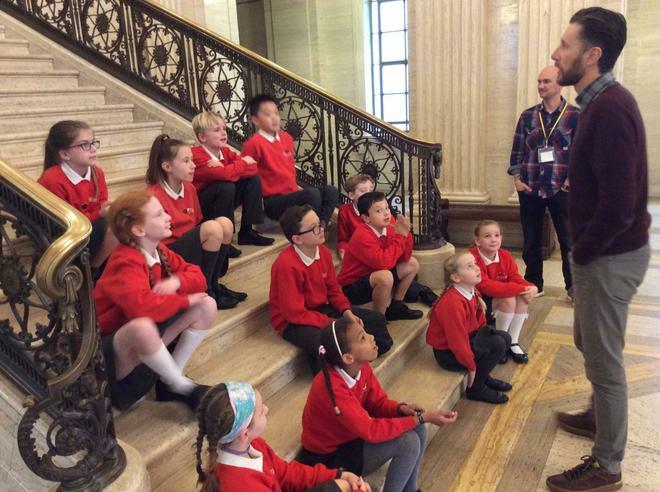 It was interesting that a visiting Spanish couple commented that children don’t have to wear school uniform in Spanish primary schools. 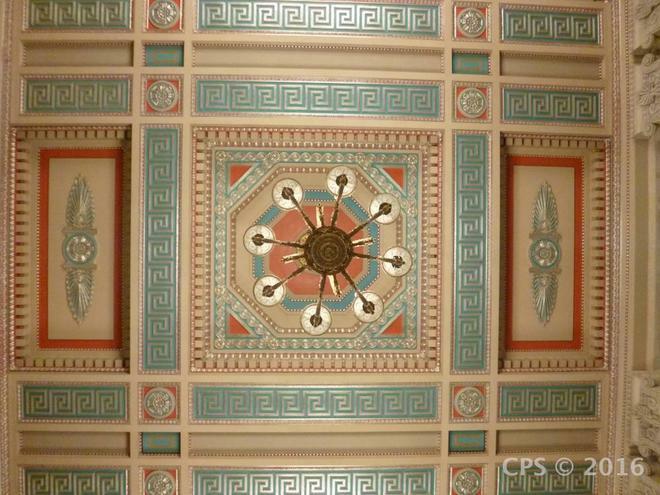 An interactive quiz tested the children’s memories of facts and we all enjoyed walking around the beautiful building to observe the Italian marble, walnut furnishings and painted decorative walls and ceilings. 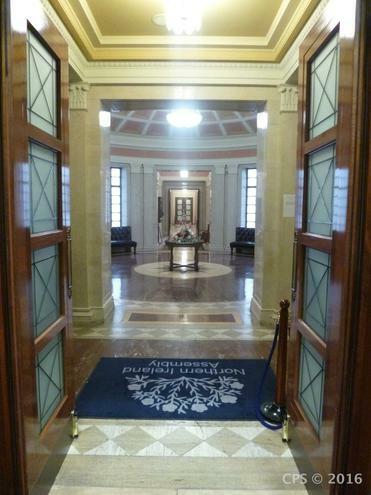 It was a thoroughly enjoyable and informative trip and we thank everyone involved in making it such a good experience. Many thanks to Mrs Graham for driving the mini bus as well! 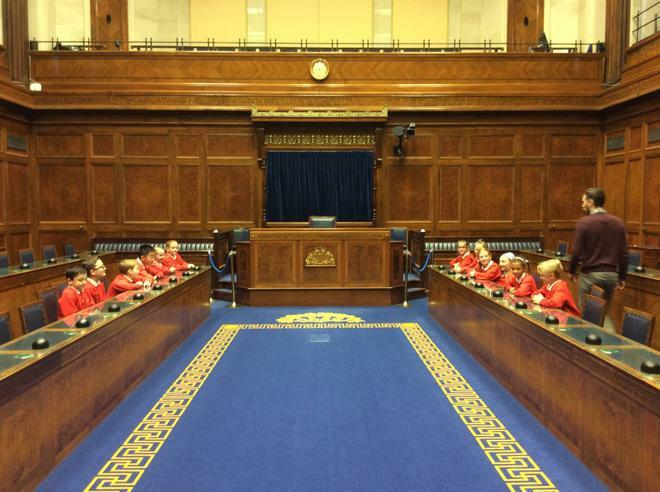 Once again, there was much excitement at the start of the year with the election of our new Pupil Council representatives from each P5, P6 and P7 class. 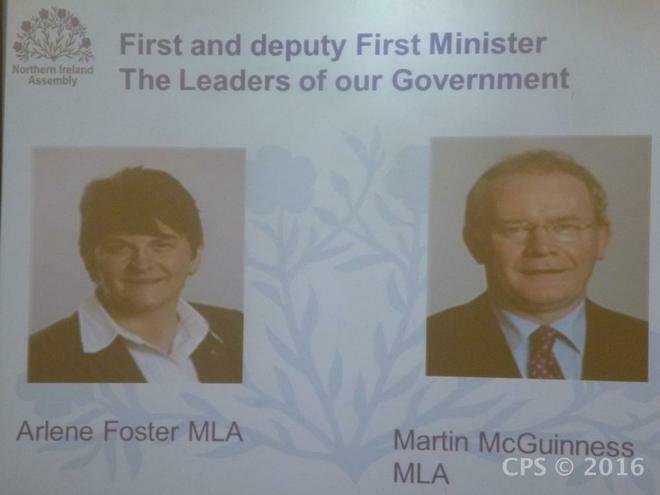 The successful candidates inspired their peers to vote for them. Ideas presented so far are varied and thought provoking. 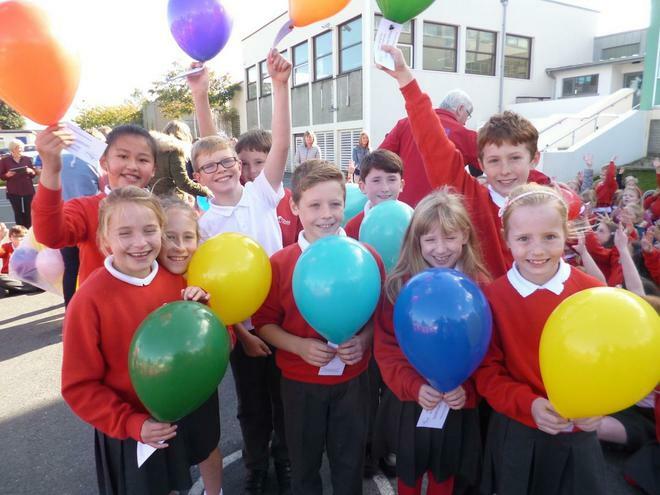 All School Councillors have already displayed a love for their school and a desire to be a caring friend alongside the ability to confidently express views and opinions. The children read their speeches at KS1 and KS2 assemblies and were presented with their lovely new badges from Mrs Graham. Last term, the kitchen staff at CPS asked School Council to carry out a survey to discover which foods are most popular at lunch time. The children also had the opportunity to suggest which foods they’d like to see on the menu. 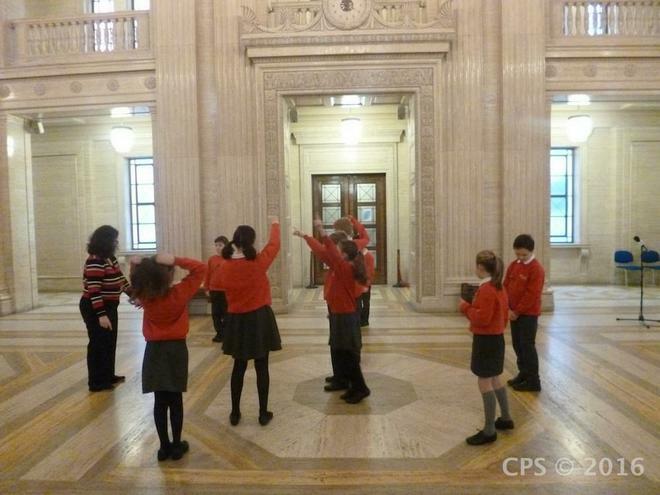 We are also very excited to have recently viewed an animation put together by a film crew from Stormont Assembly Education service. 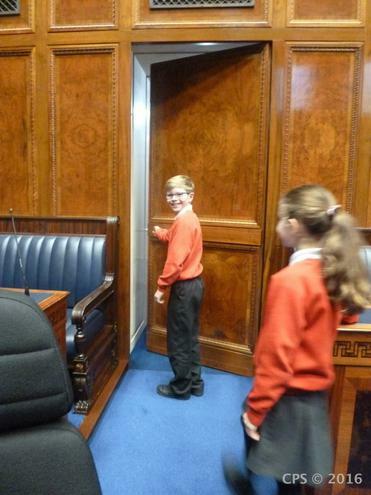 Lewis Gibney’s voice (P7 pupil last year) was recorded as part of a short film which was put together to demonstrate how School Council reflects the same work carried out by MLAs at Stormont Assembly. 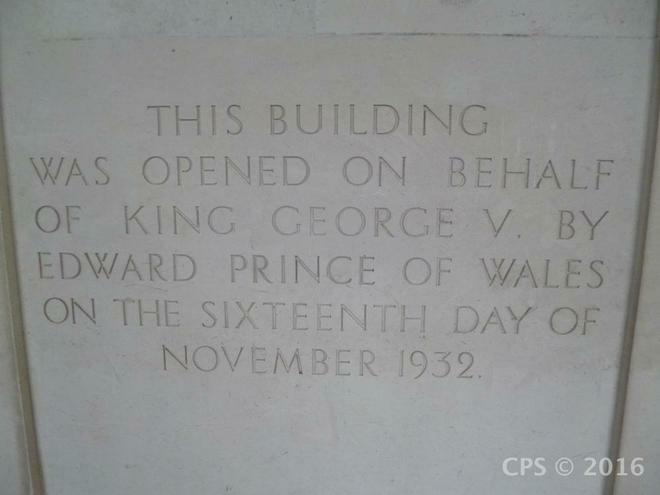 Our school building was photographed and we are very pleased to be involved in this project. 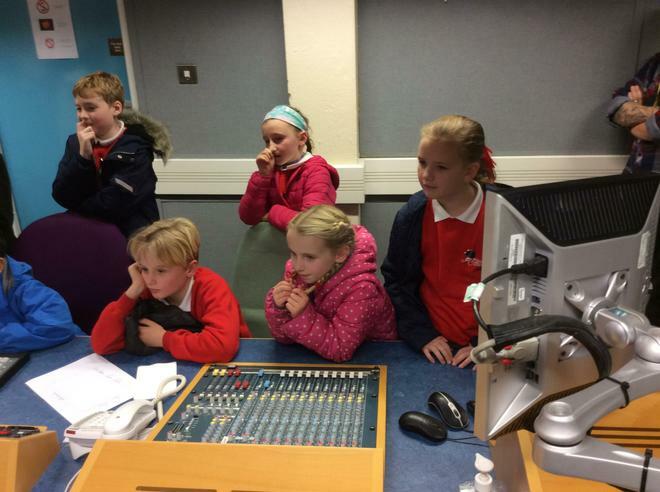 The animation will be available to view on our School website very soon. 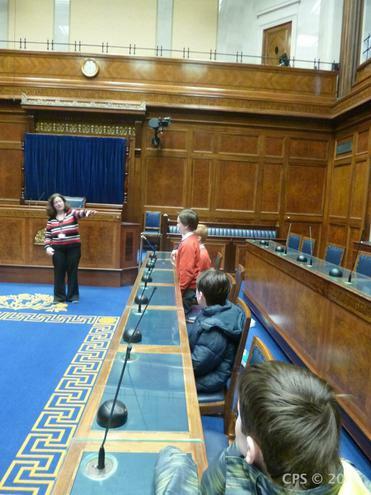 It will also be available to view on the Education area of the Stormont Assembly website. 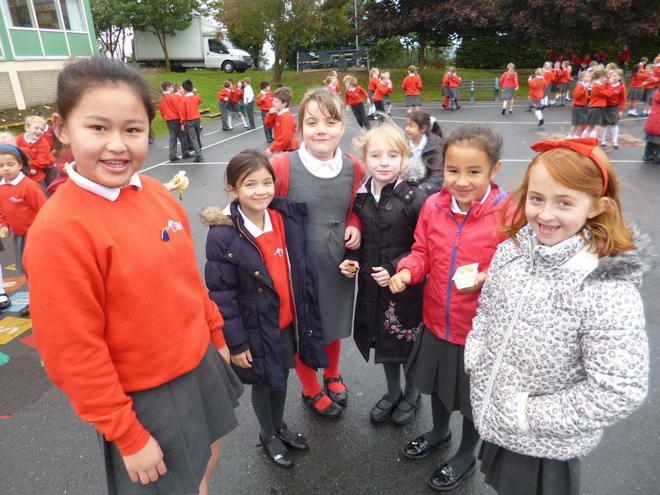 Our Break time Buddies scheme has started once again and already the younger children have met their older friends to play and chat with. Each classroom has a School Council Agenda Board for suggested ideas to be discussed at meetings. 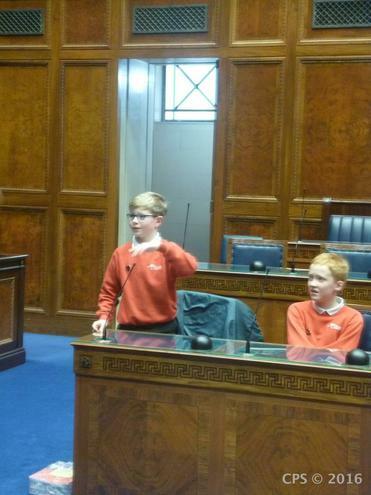 We have also organised a new Chairperson and Secretary for the first term. 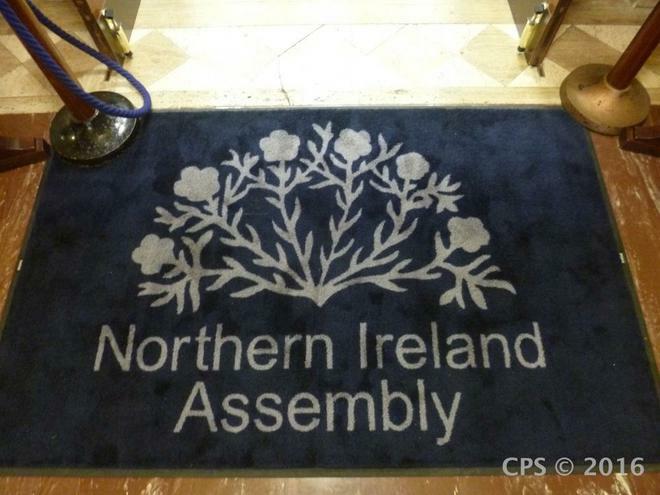 In November we will be visiting Northern Ireland assembly buildings to learn about the work of MLAs and to view the magnificent Stormont building itself. 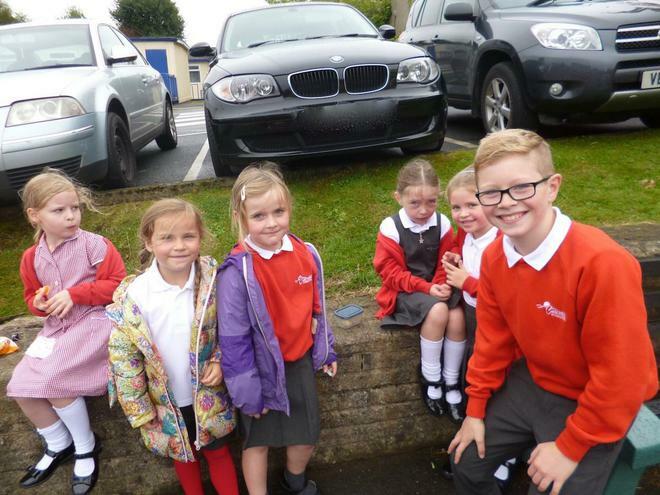 We wish the children a successful year as they work together to make our school an even better place than it is already. 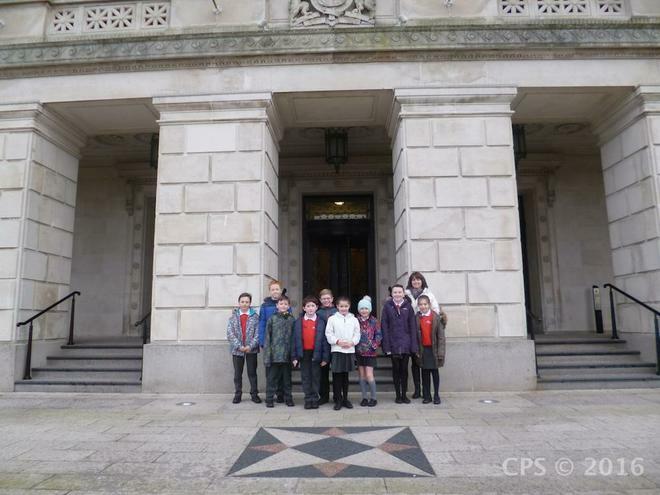 The School Council was delighted to have the opportunity to visit Parliament Buildings at Stormont on Wednesday 13th January. 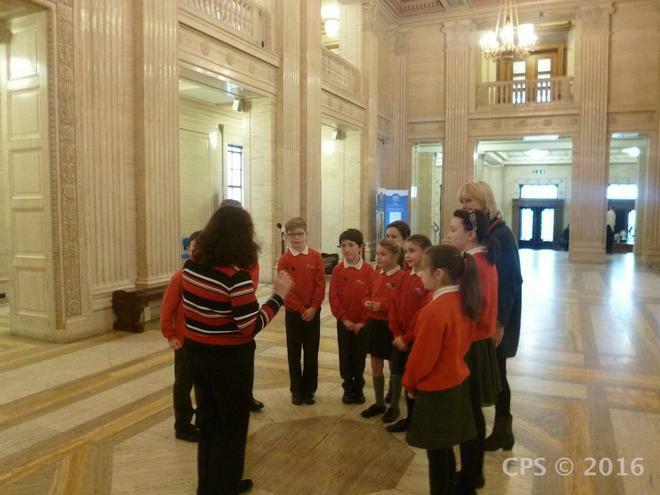 Nine pupils from P5, P6 and P7 were accompanied by Mrs Graham and Miss Bingham. 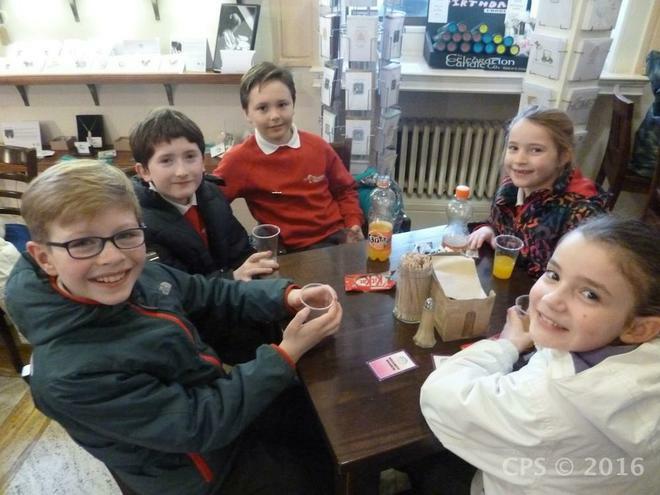 On arrival we all enjoyed some refreshments in the coffee shop and enjoyed viewing some of the local crafts for sale. 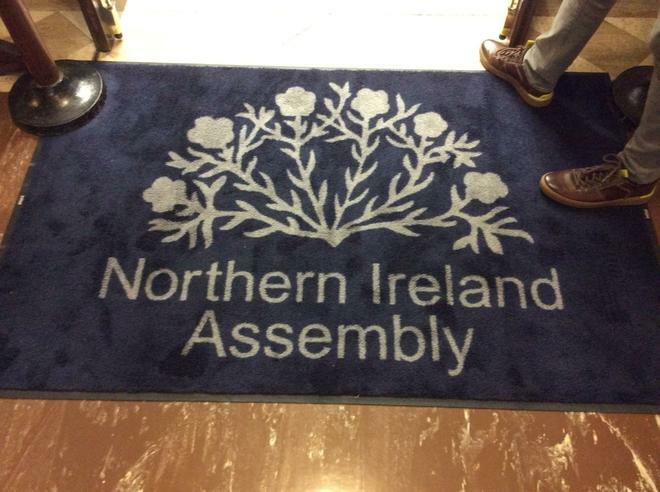 We were welcomed to Stormont by Emma Pengally, a South Belfast MLA and we also had the opportunity to meet and chat with Fearghal McKinney, another South Belfast MLA. 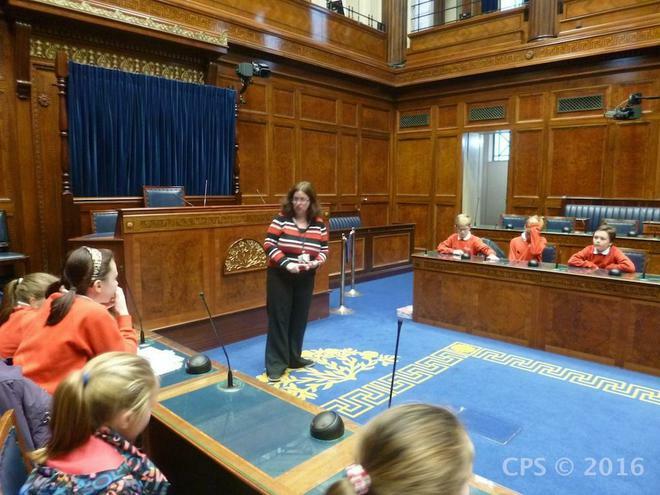 Anne- Marie Fleming, Education Officer gave the children a short tour and provided lots of facts about the history of Stormont and explained how the Government of Northern Ireland operates. 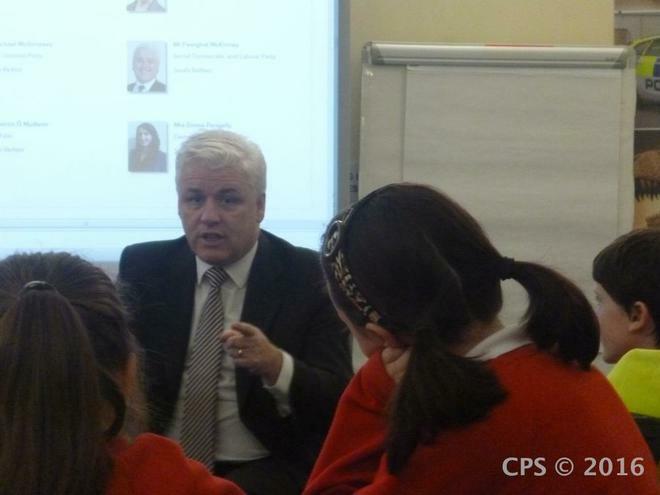 The children then answered quiz questions using electronic devices and discovered how much knowledge they had retained. 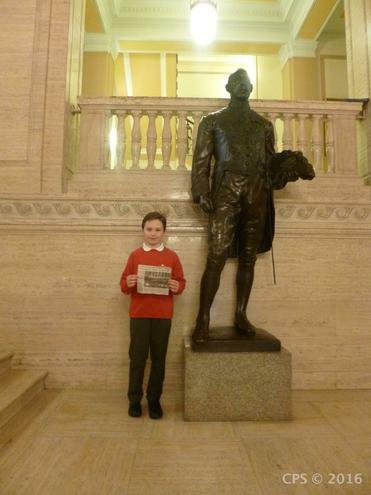 The children were given the chance to ask questions and Seth in P6 had brought a newspaper cutting showing his great grandfather, pictured with a large group of builders and plasterers who had helped to build Parliament Buildings in the 1930’s. 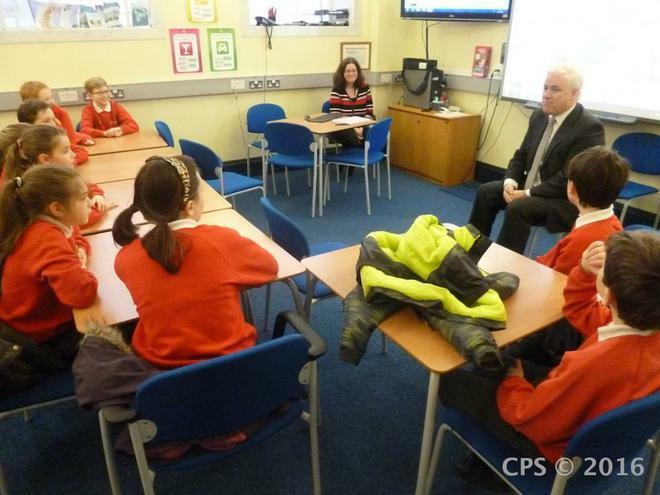 The children and teachers were then allowed to sit in on a discussion addressing Bullying in schools. Everyone had to sit in silence and observe the gallery rules! 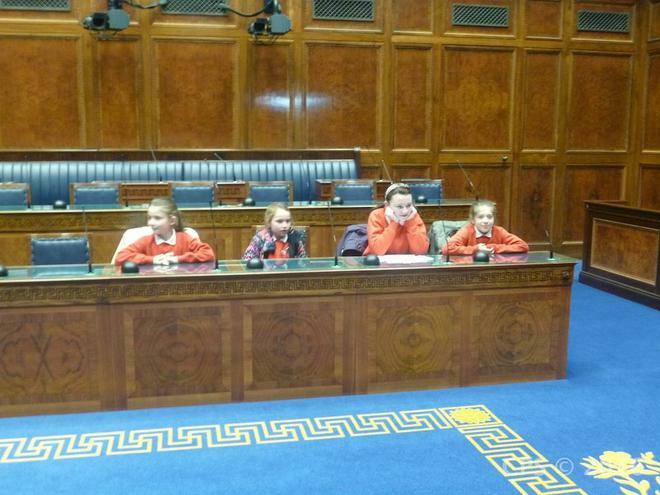 This was really interesting and allowed the children to observe how discussions they have at School Council meetings are similar to those taking place at Stormont. 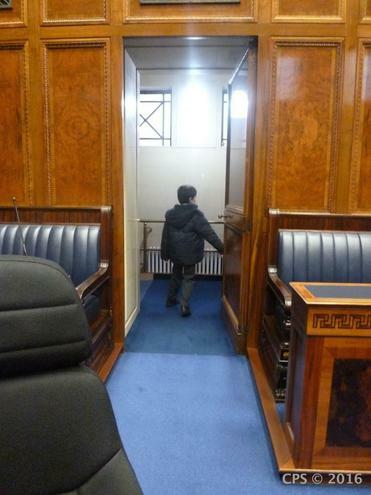 Finally the children made their way to the main hall where they were allowed to put forward their ideas for a new law in a mock debate! 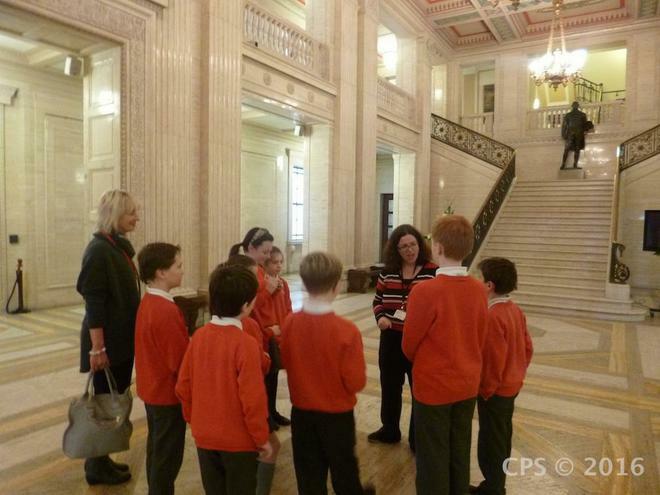 Everyone had a really enjoyable morning and gained a greater understanding of life at Stormont! 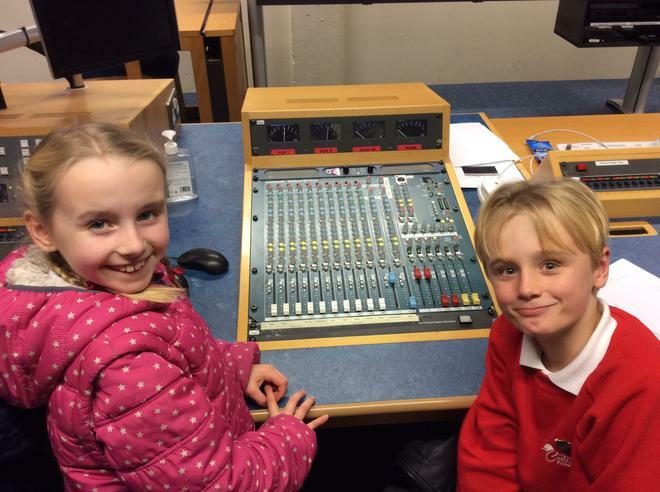 School council Christmas concert ticket and programme cover competition. 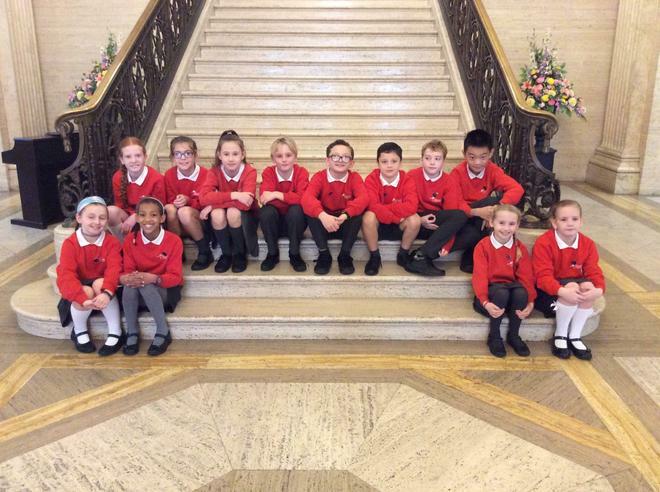 The School Council recently held a competition, inviting P5 and P6 pupils to design a picture to be displayed on the afternoon or evening tickets. 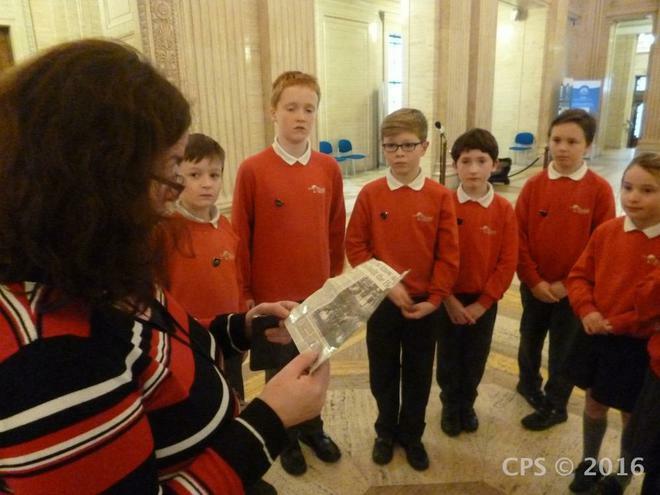 P7 pupils were given the chance to have their drawing on the cover of the programme. The name of the concert is “The Greatest Gift of All” and this provided the inspiration for the designs. There was a lot of interest in this competition and the School Council enjoyed carefully looking at each design and judging the winners. 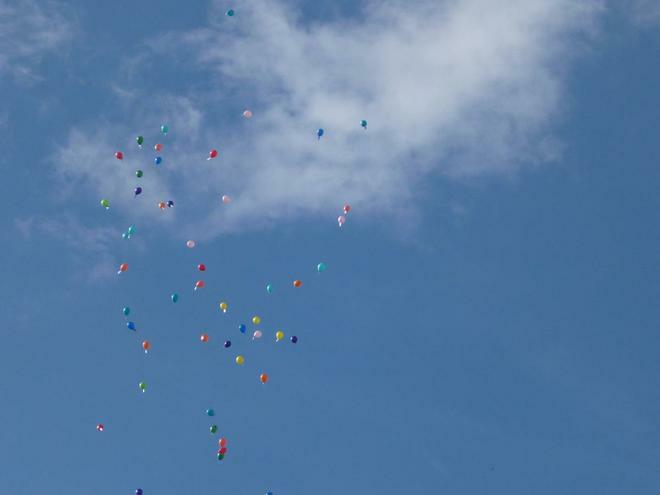 The winner for P5 was Gilia Li P5M and her drawing will be displayed on the afternoon ticket. The winner for P6 was Daniel Parkinson P6B and his drawing will be displayed on the evening ticket. The winner of the P7 section was Lauren Millar P7M and her drawing will appear on the cover of the programme. 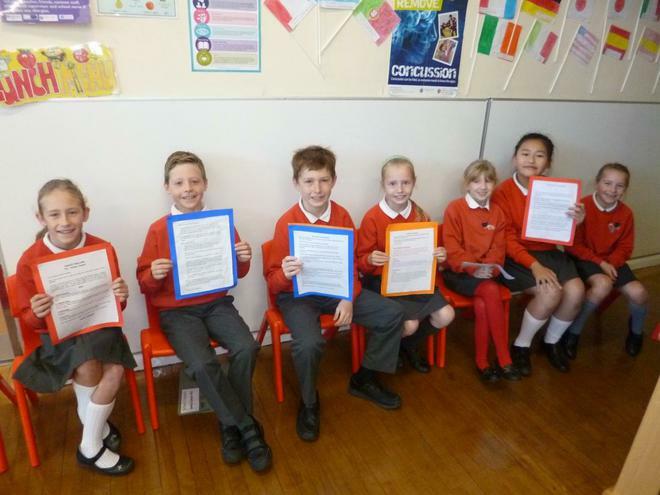 The School Council would like to thank all the children who entered the competition and well done to the winners! The winners received a selection box and are thrilled to have their fantastic art work on display very soon. 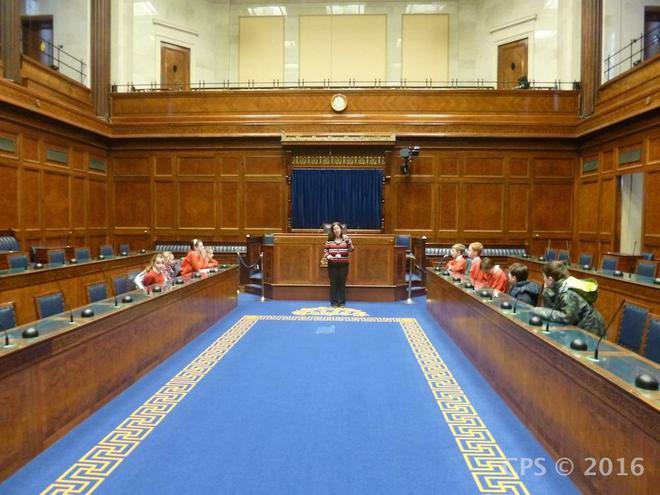 Last year’s Speaker’s School Council Awards was the most successful ever with the Speaker receiving over 700 applications! 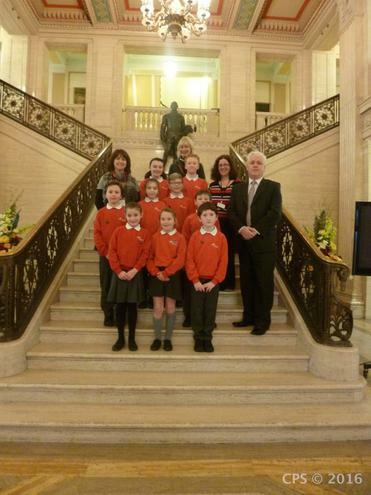 Our school council entered the competition using our “Name the fish” competition. We explained how the project was inclusive and promoted a caring environment. Having personally named fish to look after, allowed every year group to have a class pet. 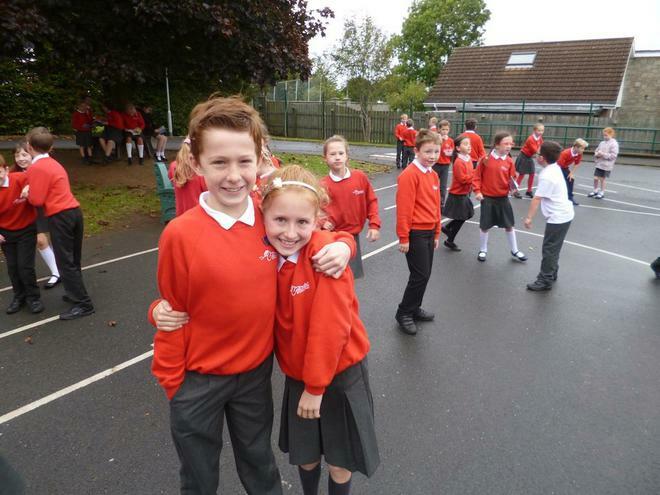 The children in the School Council worked hard to take photos, produce posters and make decisions on the best names. Unfortunately, on this occasion, our entry was not selected as one of this year’s winners. 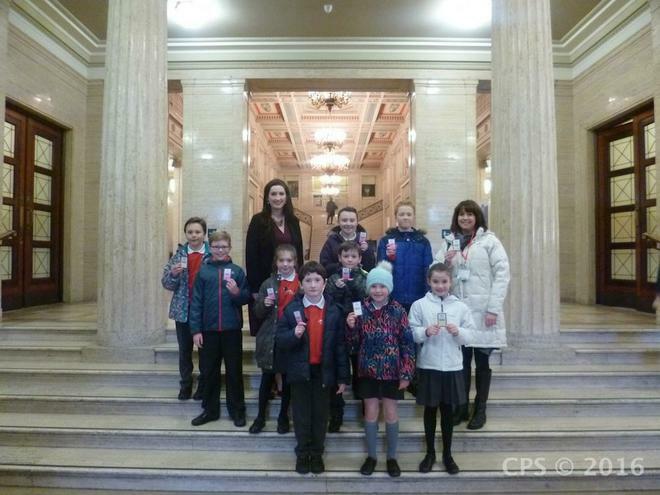 However we did receive a digital badge from the House of Commons to celebrate our pupils’ achievements. 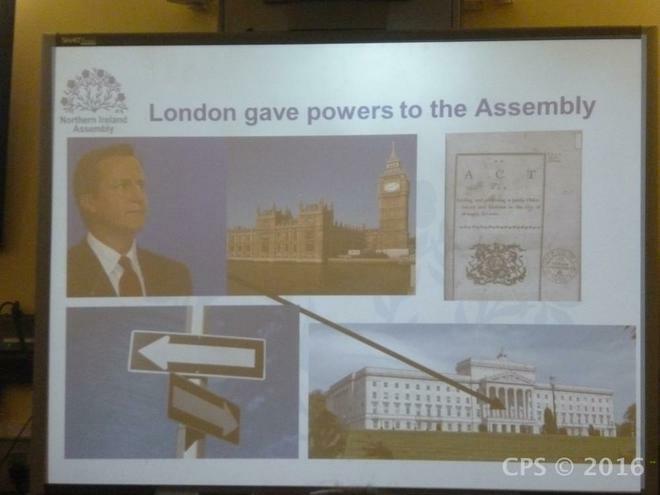 Our school will also receive a certificate in the post. 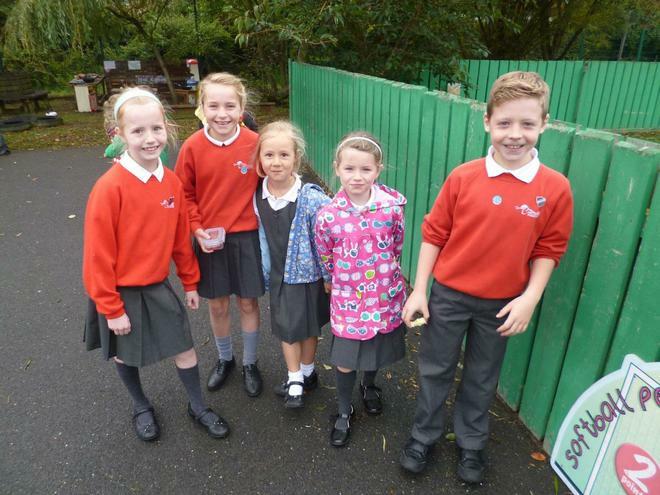 Well done to everyone at school who got involved and don’t forget to keep a check on our fishy friends!